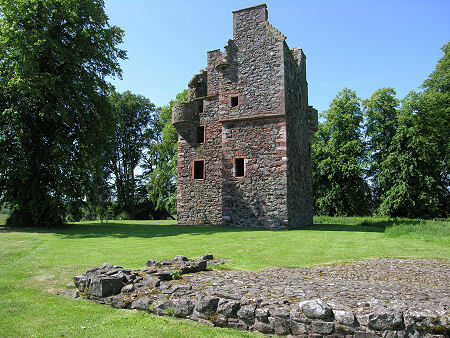 Five miles north east of Earlston and just to the west of the village of Gordon, the surprisingly complete remains of Greenknowe Tower, also sometimes known as Greenknowe Castle, stand a hundred yards to the north of the A6105. Leave your car in the pull off on the verge by the gate: carefully, as this is a fast road with poor sight lines. From the gate the access path leads up a gentle slope and around to the entrance, as usual for a tower house this is placed in the easily defended angle between the main body of the tower and the wing containing the spiral staircase. 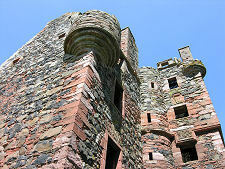 Externally, Greenknowe Tower is in good condition, largely complete up to the original roof level, though part of one corner turret has collapsed at some point. The appearance of the tower is made all the more interesting by the use of red stone in parts of the structure, brightening up what would otherwise be a uniform grey. 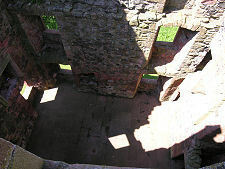 The tower would originally have been surrounded by a walled courtyard, and part of the courtyard surface can still be seen to its east. 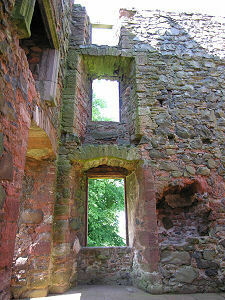 Internally the kitchen on the ground floor retains its vaulted roof, but from the first floor hall upwards the tower is open to the skies. The spiral stair can be followed up to a platform at the upper floor level in the stair wing. 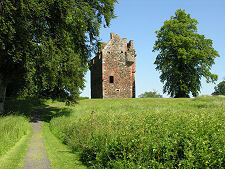 Greenknowe Tower was built in 1581 by a minor landowner, James Seton, and he lived here with his wife Janet Edmonstone. 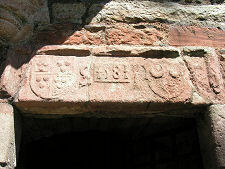 The lintel above the main entrance carries the date of construction, the shields of the Seton and Edmonstone families, and the initials IS and IE: the "I"s should be read for "J"s. The Seton family had owned land in the Parish of Gordon since marrying into the Gordon family: who in turn had been granted the estate by Malcolm II in 1018. 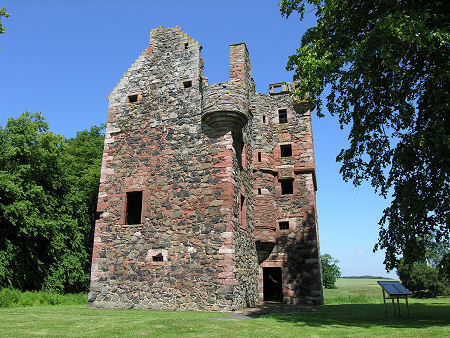 In the 1600s the tower was purchased by the Pringle family of Stichel, one resident being the noted Covenanter, William Pringle. By 1850 it was no longer lived in, and in 1937 it was placed in state care by the Dalrymple family, who also contributed towards its consolidation. 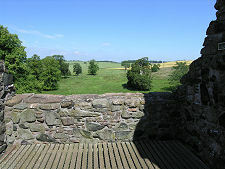 Today Greenknowe Tower is in the care of Historic Environment Scotland.